And, along with it, certain opportunities disappear. While you still can, take a moment to stop and smell the roses when they're in bloom (photo). You don't have to be a florist to be interested in them. Would the world be a more enjoyable, rewarding place if every puppy discovered roses like this? ... it could be, for them. 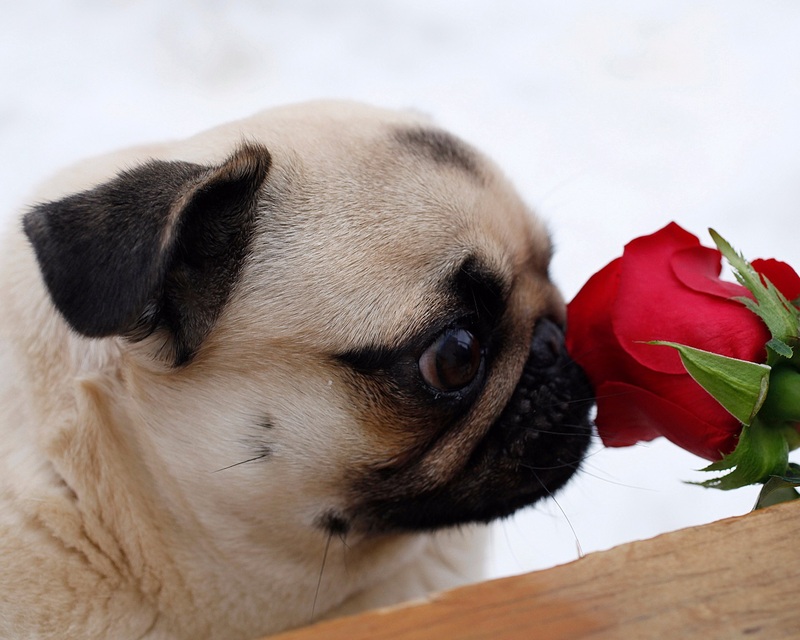 You can bet that the next time this puppy sees a rose, he'll know that he likes them. He's learned to like something that didn't immediately grab his interest until he checked it out. In this respect, humans are no different; when we show interest in things that don't immediately grab us, many times we emerge liking them. There's no weakness or shame in investigating our world like this. Life here is short, and the wisest knows not how short it will be. It doesn't always dawn on us, in our daily mission to get to work on time so we can pay the bills, that we're up to our waistlines in blessings of all kinds all the time, most of which we tend to ignore. If you haven't before, you owe it to yourself to make up your mind today to do something different besides cook, eat, clean up the dishes, sleep, work your regular job, shower, wash clothes, shop, put gas in the car or truck, watch some TV, work your hand held device, work your notebook PC, exercise, take out the trash, and addict yourself to a stagnant routine like this, day in and day out, for the remainder of your natural life. Some things have to be done to maintain the status quo, but they don't tell the whole story about why you and I were put here. There's more to life than that. Life is precious, and we're only given one shot at it. Why not give something new a try, something you think won't be fun or rewarding at all. The one and only Elvis Presley, American singer, guitarist, actor, and universally acclaimed "King of rock 'n roll," as he was growing up with his mother, was as poor as a church mouse. One day in 1949, after his mother worked, scrimped, and did without to save up enough money to buy Elvis a present for his 14th birthday, Elvis wanted a rifle so he could shoot rabbits, but that new rifle cost 26 dollars, and all his mother could manage to save was 14 dollars. She spied a guitar hanging on the wall in a store which cost exactly 14 dollars, just what she had saved, and she bought that for his birthday present instead. He complained to her at the time that he didn't want to play the guitar (!!! ), but she got it for him anyway with the promise that she'd start saving up again for that rifle. That guitar of his sat in his closet at home for 2 years until one day in 1951, when he was 16 years old, this young man made up his mind to take a little interest in it, get it out of his closet, and start fooling with it. That one little, commonplace, 14 dollar acoustic guitar that came from the Western Auto store in Tupelo, Mississippi that day helped to change the world of music forever, and today it's worth millions. Elvis, if he were alive today, would be the first to say, "Don't do as I did and shut yourself out like this, let the world see what you've got." If you've managed to shut yourself out like this, too, it's never too late to do as Elvis did and turn it around. Always remember that the most human characteristic we humans have is our creativity, and all it takes is one moment of pause in our daily routine... one "Elvis turnaround" ...for a whole new world to open up just like it did for him, a world that's likely to nurture and enrich our own life and the lives of the people around us, uplift our spirits, draw the best out of us, and even infuse us with the strength to carry on. It's time to appreciate, if we haven't already, not just our own oyster but the whole ocean around us, all it has to offer, and begin to sense our own role in it. We can't expect the younger generation to read a book when they never see us reading one. Good organ music does that. Anything good in music does that ... big band, swing, jazz, ragtime, Sousa marches, fife and drums ... the list goes on. If not right away, then in time, they'll be glad to see your interest in music like this growing. They also have ears and can be thrilled and moved by hearing the same things you're listening to; in time, they might even be tempted to take an interest in it, too. You can use that opportunity, if you haven't already, to teach them the story about Elvis. And if that happens and they do something about it, you'll be thanking yourself for it, many times over.